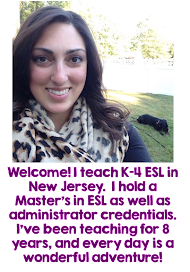 Practicing authentic speaking tasks is something I prioritize with my English Language Learners. Incorporating seasonal themes makes it engaging and fun. With Thanksgiving around the corner, I decided to use felt to allow my students to express their creativity and practice speaking and writing skills all at once. I started by cutting out felt turkey bodies, feathers, beaks, and legs. It's a great medium to use because felt sticks to felt, there's no mess, and it's soft and easy to work with. In October we made felt pumpkins, and in December I'm planning to make felt gingerbread. 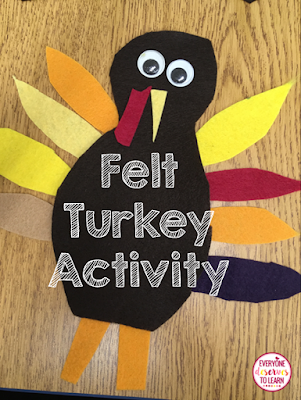 I made a sample turkey for my students to see, as well as to model my own 10 Finger Sentence. When I model, I make sure I make mistakes (and it's very easy to make a mistake!) so my students can watch my thought process as I progress from idea to spoken word. Then it was time for my students to get creative! I used this as a center, so I only had 2 or 3 students working on it at a time. That meant there were plenty of feathers and eyes to go around. Each student had time to create his or her turkey, then think about a 10 finger sentence. My students have learned to tap their fingers against the table or against their hand to count as they go. I LOVE using 10 finger sentences as a prompt, because it really makes the kids think about what they're saying, rather than just rattle off some words. My students who are brand new to the country even get in on the action, with a modified 5 finger sentence. The great thing about 10 Finger Sentences is the structured flexibility: kids can be creative while sticking to correct grammar and sentence structure. Once they completed their 10 Finger Sentences, they have a chance to write them down and share with the class. Want to grab these writing pages? Just enter your name and email address in the pink bar below, and you'll get an email with the link to download. How do you encourage authentic speaking in your classes?